When a locally owned and operated independent newspaper publishes its 900th issue, it’s worth taking note. 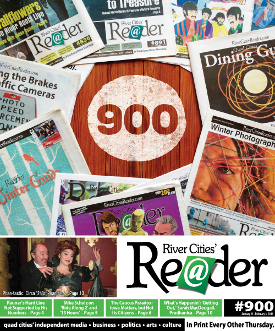 Remarkable as this 22nd-year milestone might be, given the Quad Cities’ over-saturated media market, what makes the Reader’s longevity truly extraordinary lies with its small staff. Our dedicated team has consistently infused the publication with original ideas, creative story angles, in-depth analysis, exhaustive inventorying of our area’s culture, self-deprecating humor, and mad skills in generating effective client advertising. And the Reader’s availability on the stands is ubiquitous (some say maybe taken for granted) thanks to a distribution force to be reckoned with. As a wordsmith, I can tell you there are none adequate to express the gratitude, admiration, respect, and undying affection we have for our team. A mainstay for these 900 issues has been to cover topics under-reported in the mainstream media, informing readers about critical issues and perspectives otherwise absent in conventional coverage. Such topics that deserve deep scrutiny in 2016 are many and varied. Here are some to kick off the next 900 issues. The most important action each of us can take in 2016 is to effect a shift in our thinking about all things political, beginning with how we identify ourselves politically. By affiliating as a Democrat or Republican, we play into the hands of a system designed to manipulate our viewpoints. The primary objective is to keep an irreconcilable divide between the two parties’ members’ perceived ideologies. We can then be managed because we become entirely predictable, giving the system all the protection it requires to carry on with its own agenda(s) against our wishes. If American voters would suddenly discover that each of us is on the same page with the vast majority of the issues, the current political system couldn’t survive because solutions would become the articulable focus of voters, hence the measurable responsibility of the politicians and bureaucrats to deliver. If they don’t, they are replaced. Because solutions are antithetical to politicians and bureaucrats, the fight to thwart such accountable parameters is priority one of the two-party system. This critical primary directive is evidenced by decades of growth in government regardless of which party is in control. Both Democrats and Republicans are devoted Progressives, meaning society’s problems can only be solved through government intervention(s). Use your imagination and think for a moment about how politics might be changed if suddenly it didn’t matter which party a candidate belonged to. Pretend for a moment that parties didn’t exist. What would you need to know to support a candidate for any of the offices being vied for? Would the same old rhetoric be enough then? As a voter in this scenario, you would need to know a bit more about the issues and problems facing the country, state, county, or city before you could discern worthy responses from candidates. Sadly, political-party affiliation absolves many of us from even that degree of engagement. We are systematically reinforced with the belief that one of the two parties represents our ideologies, reducing our responsibility in casting a vote down to nothing more than a binary party affiliation. It is a brilliant scheme that only succeeds because of our civic laziness, and our unfathomable unwillingness to do our part in what was designed to be a constitutional republic. We have temporarily forsaken the guiding principle that defines America, which is that each individual holds the power for all levels of governance in this country. The federal government has limitations, regardless of how many self-serving laws it makes to advance itself. But without vigilance and necessary challenges by us, there will be no stopping it. We need to remind ourselves that we are not government’s subjects. Each of us can start with some level of commitment to engage on a local level first, where it is entirely possible to make a difference. For instance, attend city-council or county-supervisor meetings once a month. We all have time for some degree of civic interaction. But first and foremost, break the right/left paradigm that is shackling us to burgeoning social and economic problems that are not getting solved by supporting the status quo. Start identifying common ground without the liberal-versus-conservative filter. It is a complete falsity and pure theatre in American politics anyway. Experiment by not being a mere puppet.